The Master Gardener (MG) Program was originally created to develop a volunteer staff to assist Extension agents in answering gardening questions. Over the decades, educational efforts have expanded beyond answering the phone in the county extension office—although this is still a component of many local MG programs. MGVs are the face of UW-Extension Horticulture in many counties, offering numerous educational opportunities for the public. This education involves teaching horticulture in a variety of ways, whether through special workshops or annual seminars, providing research-based information at local gardening events or answering questions on traditional UW-Extension supported garden lines to help others make appropriate decisions to manage pests and problems in home landscapes, make informed choices when purchasing plants and garden related materials, and make judicious and environmentally appropriate decisions for pest management. Wisconsin Public Television has recorded seven of the educational programs at the regular monthly meetings of the Dodge County MGA for the University Place program. WPT’s Media Relations Specialist described the meeting topics as “energetic and interesting” and “fascinating to the University Place audience.” In this way, these educational programs have reached a much broader audience and MGVs have received positive feedback from around the state as they have aired. MGVs teach classes on various topics or give talks for other community organizations. Many local MG Associations (MGA) include an educational session open to the public at their monthly meetings or give talks through other ogranizations. Many groups write educational newspaper or web articles and connect with gardeners by many other indirect means to engage them in gardening and to connect with UW-Extension resources. In Dunn County, each MGA meeting begins with a training session. Some examples include: a registered dietitian discussed the nutritive value of food grown in gardens; a naturalist at Beaver Creek Reserve presented foraging and explained how edible plants are identified, collected and prepared; and invasive species. MGVs in Florence County presented a program on grasses and perennials to a local historical society for their annual garden seminar day. MGVs in Marathon County offered nine education programs attended by 188 MGVs and 77 others. Eau Claire MGVs had an average of 30 people attending their meetings to learn about such topics as food preservation, permaculture, and cover crops. Programs at Waupaca County MGA meetings have been on butterfly gardening, bulb planting, the Chelsea Flower Show, tomato grafting, and gardens to visit in Wisconsin. Sawyer County MGVs made presentations throughout the year at local libraries, garden clubs, and senior centers. 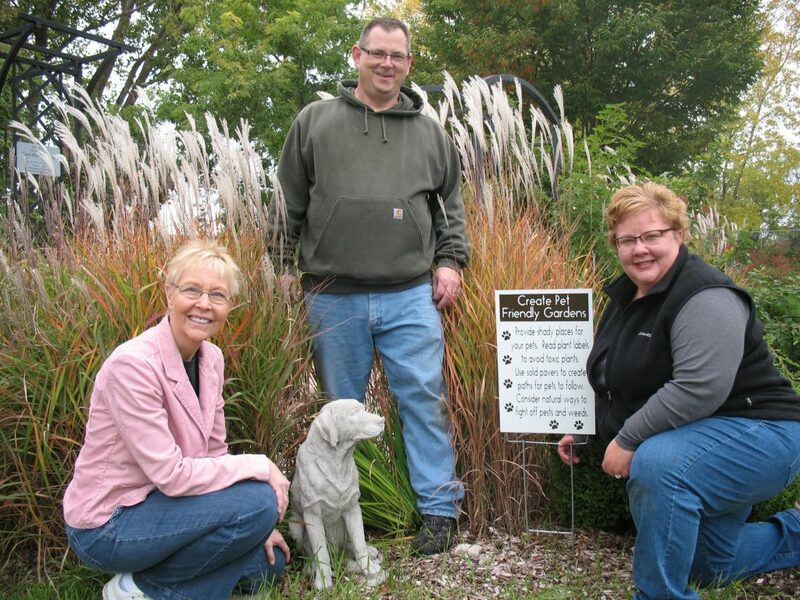 Winnebago County Master Gardener Volunteers teamed up with the Oshkosh Humane Society in order to create a program on pet friendly gardens. MGVs staff booths at county or area fairs, farmers’ markets, and other community events to answer horticulture questions from the general public. They often answer questions during local garden walks, plant sales and many other activities. Many MGVs MGVs trained as Plant Health Advisors (PHAs) answer questions in the local county UW-Extension office in person or remotely. Kenosha and Racine County MGVs trained as PHAs staff the horticulture helpline three mornings per week during the growing season, and attend the Kenosha Harbor Market two Saturdays per month from May to September. MGVs in Manitowoc County enhanced their Plant Clinic by moving to a more visible spot with signage at the UW-Extension Office and distributing flyers to local businesses about the Clinic. After a 12 year absence, the PHA Program returned to Door County. MGVs came to the UW-Extension office to answer homeowner horticulture questions during the growing season. 12 MGVs trained as PHAs work in their own office at the Jefferson County UW-Extension office, 2 days per week, serving 50 clients who carried in, called, or emailed questions and problems. Dane County MGVs with PHA training answered gardening questions from 1,116 people at six area farmers markets, as well as 589 contacts on the seasonal Horticulture Helpline. In Milwaukee County, the plant diagnostic services were revamped in 2016 to allow county residents to submit plant inquiries at any time and MGVs to respond whenever and wherever they wanted rather than coming in to the Extension office or the UWEX Horticulture Center at Boerner Botanical Gardens, responding to 576 inquiries (slightly increased from previous years). The Plant Doctor Booth at the Rice Lake Farmers Market is in it’s third year. Volunteers were available with resource materials to answer questions on plant problems and diseases. A log book kept track of questions and prevalent problems for the area. Several counties have annual gardening programs with speakers and workshops on a variety of topics. The Wisconsin Master Gardener Association hosts an annual conference open to the public, and this year hosted the regional MG Conference for the Upper Midwest. Grant County MGVs hosted the first Driftless Gardeners’ Gathering in collaboration with the the Horticulture club of UW-Platteville. Nearly 80 people came to hear keynote speaker MGV Lee Somerville on Vintage Wisconsin Gardens: A History of Home Gardens, and other presentations. Portage County’s Garden Dreams was attended by 147 people who learned about creating a pollinator paradise, sensational shrubbery, indoor gardening and houseplants, and ponds. At Ready, Set, Grow, Eau Claire County MGV’s garden seminar, over 200 people had an opportunity to learn about various aspects of gardening. With 20 plus vendors present there is also a positive economic impact to gardening related businesses in the Chippewa Valley. Over 90 gardeners attended the Green County MGV’s 9th annual gardening symposium Gardening Inspirations for All Seasons: Tasteful Gardening for Style and Fun in Monroe. MGVs from several counties spent many hours organizing tours, working on the planning committee, hosting sessions, helping with the silent auction, and numerous other tasks for the Upper Midwest Regional MG Conference held in Wisconsin Dells for over 200 participants. These are just a few examples of the many ways MGVs throughout Wisconsin are working to teach about growing plants and answering horticulture questions in our communities. Read more stories about the success of MGVs working with people in their communities on the pages in the full 2016 MG Program Annual Report.